Van Reid sounds like a last name. But that's his first and last. Thankfully, Cordelia Underwood is not the last but merely the first of the adventures of the un-famed Moosepath League. 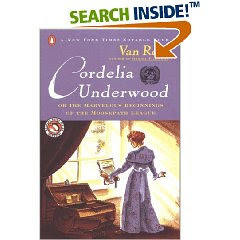 If this review of Cordelia Underwood seems a little ambiguous, it is only because Van Reid makes himself so. Not even Wikipedia could offer very much in the way of information! (I'm not really sure if that's saying very much.) You can check out the official Moosepath League website if you are curious. "What a lot of folderol!" she said when Mister Walton entered, but it was clear that she was enjoying herself. "What is that young man with you?" "A friend of mine, traveling with me," said Mister Walton. "Yes, I guessed that, didn't I? I like him, though. He's not too handsome and he stands straight. I would like my great-granddaughter to marry someone who isn't too handsome. Her father was very good-looking and he slouched, and I was never very fond of him. He used to look at himself in the mirror, and he denied cheating at solitare." "Did he cheat at solitare, then?" wondered Mister Walton cautiously. "Of course he did! Everyone cheats at solitare! Denying it, though, indicates a lack of character. Do you cheat at solitare?" "Well," said Mister Walton, chuckling heartily, "I have flipped an extra card now and then. It seems so much trouble to reshuffle the deck." "There! Do you see? You have character." "It's very kind of you to say so. I shall remember your rule." Mrs. Eccles waved a hand impatiently. "Folderol!" she said. I read this book along with my online bookclub, Bookfest, and could not be more happy with it. Our QOC gave the initial review of it, which you can view there. If you have a chance to pick up this book, I would strongly encourage you to do so. Yes, it is 400 pages long but the chapters are short and I found it a very easy candidate to pick up and set down when time allowed for it. It's fun and engaging and not at all difficult to follow along with. Cordelia Underwood is good for a laugh, good for adventure and boasts incredible character development as well. Seriously. This book was a lot of amazing things rolled into one. (Clean, witty, charming, etc.) The New York Times branded it a "Notable Book" but don't let that be the thing to either encourage or drive you away (depending on your bent towards big recommendations.) Just take MY word for it. You want to read it. You really do! This has been on my to-read list for so long that I can't remember why I added it! Thanks for the review - I love Wodehouse, so this sounds like one I'd enjoy. Ahh my sister and I found these books a few years back, I'm still looking for them at Thrift Stores and Garage Sales. To me it seems that he loosly based this on The Pickwick Papers by Dickens, but I could be wrong. Thanks for bring these wonderful books to light. I'm looking for a copy also. It's sounds like my kind of book. I enjoyed this book, too--I just reviewed it myself. The author really does have great dialogue, doesn't he?